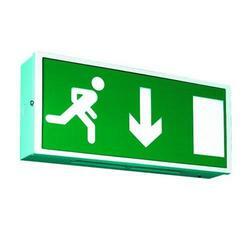 Manufacturer & Supplier of Emergency Exit Route Signage. Our product range also comprises of Security Equipment & Systems, Boom Barrier and Fire Extinguisher. 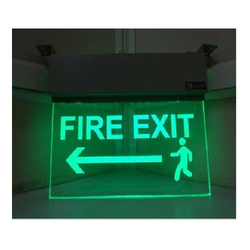 We have emerged as one of the reputed names among the manufacturers and suppliers of premium quality Emergency Exit Route Signage. Offered signages are widely demanded by our clients for their superb visibility, attractive design, glossy finish and durability. The signage’s find their application in highways, health centers and critical security zones. These are weather proof signages and offered at competitive market price. 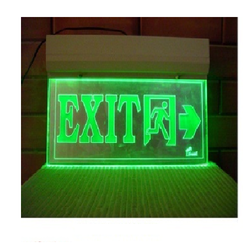 We are manufacturer and supplier of Emergency Lights , Exit Lights. They are very flexible to use in the emergency time. In this product we are offering different sizes including very smaller ones. Smaller lights are transportable to anywhere. Rechargeable Emergency Light is less power consumable and resistant to breakage. We have gained huge recognizance as a noteworthy manufacturer, supplier and trader of Laser Light Exit Plates with Battery Backup. These products have profound use in labeling certain exit location at various places for visibility from a long distance. Our offered products are designed and manufactured by skilled expertise, who makes good blend of raw materials and modern technology for these products. Furthermore, these products are available with us in wide specifications for serving precise needs of customers. High glow led 18 nos. Power consumption 1. 8 watts only. Emergency light 16 watt *2 lights , backup of 8-10 hours. Exide battery fitted.